Keep the draft beer flowing at your home bar or firehall with this one-of-a-kind fire hydrant bar tap handle. 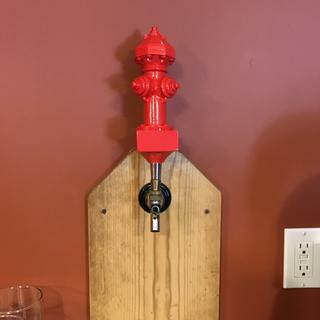 While settle for a plain, old faucet knob when you can outfit your draft system with this bright red fire hydrant beer tap handle? The design of the custom tap handle is a red fire hydrant with a chrome ferrule. The bright coloring is sure to stand out at your home or commercial bar. Sculpted out of plaster and wood, the tap handle is sturdy and durable. This bar tap is perfect for active or retired firefighters, fire hall bars, or as a fun conversation starter. It also makes a terrific gift. Top to bottom, the fire hydrant bar tap handle measures 9 inches tall. Since it’s designed to fit any standard draft faucet, you can replace your old tap handle and/or install this fire hydrant bar tap handle very easily: just screw onto the faucet lever collar atop your draft faucet. I purchased the tap handle for my nephew who is a firefighter, He loved it! Love it look perfect at the hall. Hydrant handle seems to be made with good quality! Our restaurant is Firehouse Grill and we are having Rivertown Brewery make our house lager. Purchased this as a gift for my son (firefighter). This will be a great addition to the bar in his German Biergarten. Do they fit regular commercial bar fittings? BEST ANSWER: Yes they do, mine just screwed right with no isse. What color is the plumbing piece on the bottom of the fire hydrant handle? BEST ANSWER: Hi Clifford, the ferrule piece on this tap handle is chrome colored. Cheers!